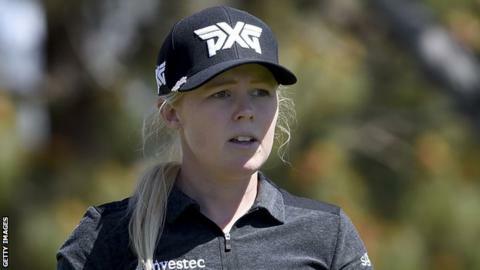 Stephanie Meadow is sharing ninth place, five shots off the pace, after firing a level-par 72 in the second round at the Kia Classic in California. Meadow, who was in second spot after an opening 67 at the LPGA event, produced a steady if unspectacular round of one birdie, one bogey and 16 pars. The Northern Ireland woman is five behind South Korea's Sung Hyun Park and Thailand's Thidipa Suwannapura. Meadow is 101st in the LPGA rankings after playing three events this season. Her best finish came in her previous tournament as she shared 40th in the Bank of Hope Founders Cup. Meadow regained her LPGA Tour card in October, having spent a year on the second-tier Symetra Tour following a lower back stress fracture. The Jordanstown native made her mark on the professional game over four years ago with a third-place finish in her first major, the 2014 US Women's Open. Following an appearance at the Rio Olympics she struggled for form before losing her Tour membership as a result of her injury. England's Mel Reid is sharing ninth spot with Reid after carding a 69 on Friday. Reid's compatriots Jodi Ewart Shadoff and Bronte Law are three shots further back after firing rounds of 70. 2017 US Women's Open champion Park and Suwannapura lead former world number one Inbee Park and her Korean compatriot Chella Choi by one stroke with Australia's Minjee Lee and Colombia's Mariajo Uribe three off the pace. Two well-taken goals from Curtis Allen give Glentoran a 2-0 win over relegation-threatened Newry City in a scrappy encounter at the Showgrounds. Ireland and Ulster captain Rory Best will retire after this year's World Cup in Japan. John Laverty is enjoying his globe-trotting role as manager for brother Eugene in World Superbikes while coping with the legacy of a life-threatening crash.